Breaking News: Fire in a hotel in India. The death toll rose to 17 from a fire that tore through a hotel in New Delhi on Tuesday, a senior official said. 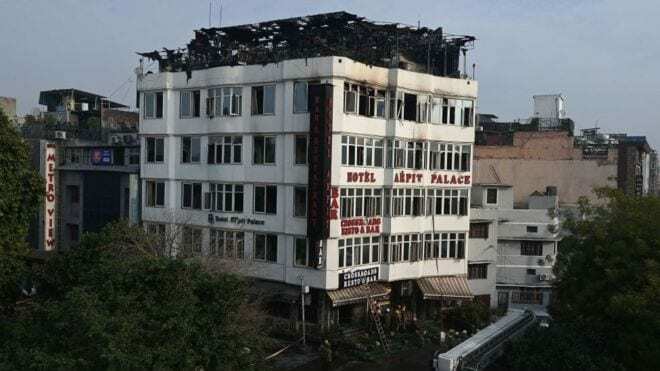 The fire broke out in the early hours of the morning, 4.30am (11:30 pm GMT) at the budget Hotel Arpit Palace in a congested part of central Delhi. Video’s circulating on social media of the incident shows people jumping from the fourth floor after breaking open window panes. “We have confirmed with hospital authorities, the toll is now 17 including a child,” Sunil Choudhary, a fire brigade official. Delhi Fire Services tackled the blaze and brought under control and confirmed that 35 people were rescued by firefighters in an hours-long operation. Images showed thick smoke and flames billowing out of the top floor of a three-storey hotel, popular with budget travellers. Many structures, both old and new, lack proper fire exits. In recent months, officials have shut down a number of shops and restaurants in some of Delhi’s most exclusive neighbourhoods for not following fire safety measures. Accidental fires are common across India because of poor safety standards and lax enforcement of regulations. Fires are common in India, a fire last December killed six people when a fire engulfed a hospital in Mumbai, the capital of western Maharashtra state. Additionally, in 2017, 14 people were killed, when a huge blaze tore through a popular restaurant in Mumbai.